Annotation: When her art history professor father is targeted by an assassin, Cassie, an American studying in Rome, discovers her secret ancient bloodline that enables her to use a legendary weapon, a legacy that is challenged by a murderous organization. By the award-winning author of The Red Umbrella. Simultaneous eBook. 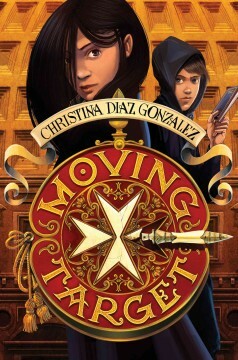 Christina Diaz Gonzalez is the award-winning author of Moving Target, The Red Umbrella and A Thunderous Whisper. Her books have received numerous honors and recognitions including the Florida Book Award and the Nebraska Book Award. They have also been named the American Library Association's Best Fiction for Young Adults, a Notable Social Studies Trade Book for Young People, and the International Reading Association's Teachers' Choice. Learn more at christinagonzalez.com. After her father is shot by the secretive Hastati, Cassie Arroyo learns that she, a marked descendant of Saint Longinus, can shape the future with Longinus's mystical spear. But the Hastati want the spear--and they want Cassie dead. Characterization takes a backseat to action--and a whirlwind of riddles, legends, and betrayal--as Cassie hunts for the spear in modern-day Italy. [Page 84]. (c) Copyright 2015 Library Journals LLC, a wholly owned subsidiary of Media Source, Inc. No redistribution permitted.